Based on the novel written by Stephen Chbosky, "The Perks Of Being A Wallflower" tells the story of 15-year-old Charlie (Logan Lerman), an endearing and naive boy, who is struggling to cope with feelings of his first love for his senior, Sam (Emma Watson), the suicide of his best friend Michael, and his own mental illness while struggling to find a group of people whom he can identify with. C’mon you guys, don’t pretend you didn’t see this one coming. It has been highly anticipated ever since Summit Entertainment won rights to the highly acclaimed novel – which I’m hoping you have in fact, read. The novel stayed at the New York Times Bestseller’s list for quite a while, back in 2000. It sold like hot potatoes, over 700,000 copies,. If you’re planning on watching this movie but have yet to check out the book, you’re in luck because most of our local bookstores still have them in stock. It’s available too as an e-book, just in case you were wondering…. The school term is starting in less than a month’s time. Oh no, the whole cycle of studying hard starts again!Are you tired of not being able to concentrate and open your eyes during lectures? Are you weary of having SOOO many assignments and just “don’t feel like doing them”, but you know you have to? 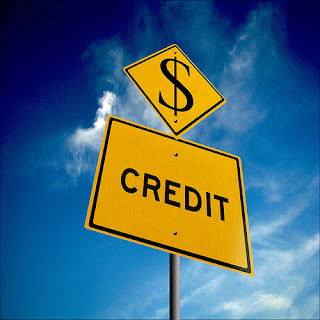 Money Matters: What is Credit History? Money Matters is a short series of articles written by Ho Khin Wai, a Diploma in Banking and Financial Services student, in an effort to raise the level of financial literacy among NYP students. He will cover various relevant topics on personal finance for teenagers in Singapore, and strives to make these articles fun and easy to understand. As we grow older, most of us will definitely need to take at least a single loan in our lifetimes. “Why do I need a loan? Can’t I just earn enough money and pay everything off in one go?” you may ask. Well, unless you are one of the super-wealthy, you will certainly need to take up a loan to buy some of life’s must-haves such as a home. You might also take up a loan when you need cash urgently, such as for emergencies or paying off debts. The thing you should realise is that your loan applications may not be approved all the time. And this is where credit histories come into play. In the town of Blithe Hollow, Norman Babcock is a boy who can speak to the dead, but no one besides his eccentric new friend, Neil, believes his ability is real. One day, Norman's estranged eccentric uncle tells him of an important annual ritual he must undergo to protect the town from a curse cast by a witch it condemned centuries ago. Eventually, Norman decides to cooperate, but things don't go according to plan. Now, a magical storm from the witch threatens Blithe Hollow as the accursed dead rise. Together with new companions, Norman struggles to save his town, only to discover the horrific truth of the curse. With that insight, Norman must resolve the crisis for good as only he can. 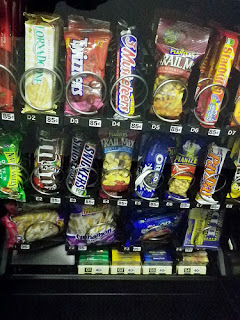 Your Assets. Your Income. Your Expenses. Your Money. There should be no one other than YOURSELF who should understand your financial needs best. If you think that there is no need to worry about how you are going to manage your money in the future, think again, because someone else might do the management (or MIS-management) for you. As we grow older, many things seem to get more complicated. One such matter is ‘Money’. We tend to think less about money when our parents give us an allowance every month. As youths, we only talk about how much to spend on food, how much to save up to buy a new pair of shoes and so on. As we grow older, however, we become less reliant on our parents for an allowance and may even look into ways to generate our own income. Often many people fall prey to shrewd marketers, sales people and their own greed. And get their finances in the red. Maybe you are thinking of getting one. Maybe you already have one of these cards. 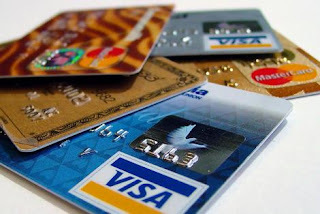 Although it may be a great alternative to getting “more cash” instantly, but if you do not pay your bills on time, you will end up paying more than what you owe on your credit card. How many of these do you have in your wallet already? Bringing the Teehee to Singapore! Fans of popular YouTube icon, Ryan Higa, also known as Nigahiga, were abuzz with excitement on 1 September 2012. The Youtube star was in town for the first time to meet-and-greet his fans, as well as to hold a Q&A session. 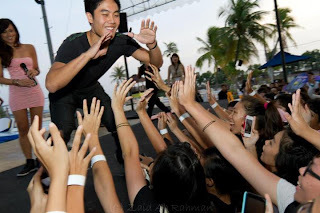 I was thrilled to be at the first-ever Ryan Higa Asia Tour. 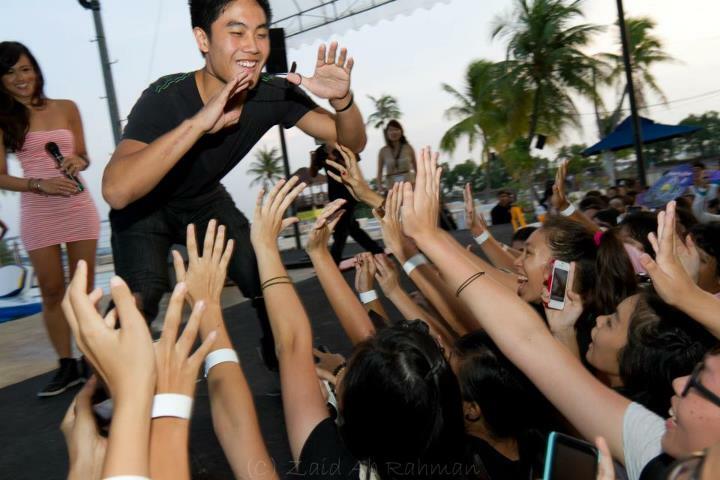 Ryan Higa hi-fiving the crowd. Image courtesy of Zaid's Photographic Journey. Dubbed the 'Usain Bolt' of robots by the BBC, Red Atom, a robot created by Nanyang Polytechnic's School of Engineering staff and students broke the world record for sprints by covering over 6-metres in 32 seconds at the FIRA RoboWorld Cup 2012. Here's a video (above) showing how fast it runs. The HuroCup competition requires humanoid robots to perform tasks such as sprinting, weight-lifting and obstacle runs. Sprinting requires precise balance and poise with each step as humanoid robots do not balance easily and are vulnerable to falls.